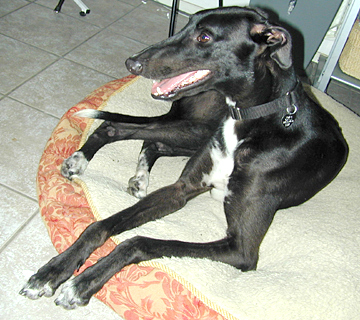 Stabler, aka Stabler, is a striking 2-year-old black male born March 27, 2003. Stablers sire is Craigie Whistler, making his grandsire Molotov, and his dam is Flying Piaget. Stablers racing career started September 6, 2004 at Gulf Greyhound Park in La Marque, moving to Valley Race Park in Harlingen and ended March 31, 2005, at Corpus Christi track. Stabler is small animal and cat tolerant. Stabler is SUCH a sweetie! Having just turned 2 years in March, he looks like a gangly teenager who hasnt filled out to fit his feet yet. He loves people and gets along well with other dogs. Hes quite cat tolerant, and generally ignores them. Being a young dog, however, he would like to play on occasion. The cats let him know they are an inappropriate choice and he backs off quickly. Hes also very responsive to voice correction. 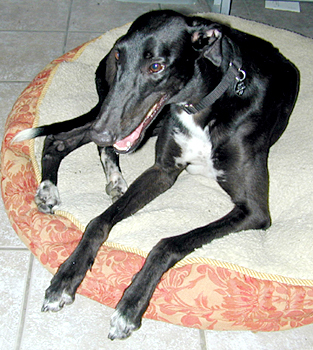 Stabler enjoys soft squeaky toys and knuckle bones, knows how to use a doggie door, and enjoys riding in the car. Come meet this sweetie pie and see if he doesnt nose his way into your heart and home!